Montauk is our nod to the modern country house. 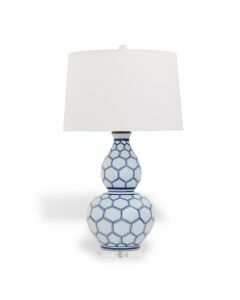 Our getaway may be in the mountains, or possibly at the beach - but the casual Montauk lamp works in both venues. It has the appearance of a brightly colored wood turning but is made from porcelain. 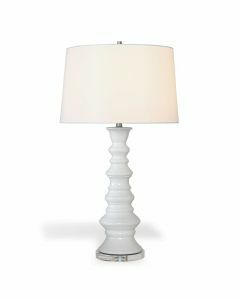 We added the unexpected with a lucite round base and nickel hardware. Scaled for bedside or at the end of the sofa at 35”H. It features a polished nickel metal cylinder finial and a 3 way switch. The max wattage is 150. 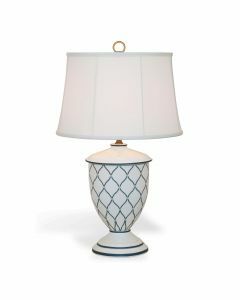 The Hardback drum shade with soft rolled edge trim measures 7" x 19" x 12" SH and is made of off white polyester fabric with a nickel spider. 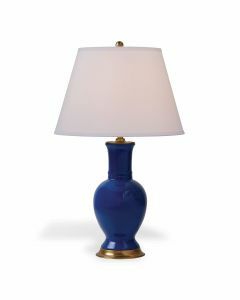 The lamp measures 35"H x 19”D. Click on images for greater detail.